The Young and the Restless (Y&R) spoilers for Monday, October 2, tease that Sharon (Sharon Case) will end up in a dangerous situation. After prying Crystal’s (Morgan Obenreder) location out of Alice (Tamara Clatterbuck) on Friday, Sharon will demand Crystal’s return. She’ll hope Alice will call up the thug who’s holding Crystal in New York City. It looks like Alice will go along with Sharon’s wishes on Monday, but big trouble is brewing. The Young and the Restless spoilers reveal that a shocking showdown is on the way. Perhaps Alice will lie that the boss wants Crystal back at the safe house. Leo may follow the false orders and bring Crystal to a specified drop-off point. Unfortunately, this plan won’t work out as well as Sharon hoped. Monday’s Y&R preview video shows the thug manhandling Sharon. He’ll demand to know what’s going on. Crystal will look terrified as she stands next to a nervous Alice. Mariah (Camryn Grimes) and Tessa (Cait Fairbanks) will seem equally concerned as they watch nearby. Sharon and the others will certainly face some tense moments. The Young and the Restless fans won’t want to miss these exciting scenes. In the meantime, Lily (Christel Khalil) and Cane (Daniel Goddard) will have to break some bad news. They’ll hold a family meeting to discuss a difficult decision. Mattie (Lexie Stevenson) and Charlie (Noah Alexander Gerry) will look somber as they learn their parents are getting a divorce. They’ll undoubtedly deal with a mixture of sorrow and anger. The teens just wish their lives could go back to how they were before. Alas, that can’t happen. Even if Lily and Cane repair the damage one day, things will probably never be quite the same. Of course, Lily sees no hope for the future at the moment. She’s convinced that this is the end of the road. 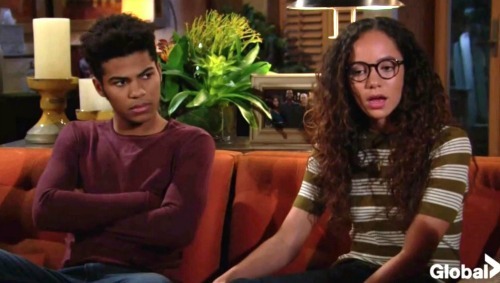 Lily will lean on Jordan (Darnell Kirkwood) for support throughout this process, but that doesn’t mean it’ll be easy. Cane will still be on Lily’s mind and in her heart. He’s made some horrible mistakes, but she still has deep feelings for him. Nevertheless, Juliet’s (Laur Allen) baby drama is just too much for Lily to take. The Young and the Restless spoilers indicate Juliet will make some smooth moves soon. Will Cane embrace a new beginning or cling to what he’s lost? We’ll give you updates as other Y&R details emerge. Stick with the CBS soap and don’t forget to check CDL often for the latest Young and the Restless spoilers, updates and news.